The Lisa D Show is Back! Hello Evanston Newbie Blog that I haven't posted on in forever, here's what I'm up to these days. Hope you are all doing fabulous! Since 2011 I've been "radio silent" and not doing anything in front of a microphone. Today I am excited to announce that "The Lisa D Show" is BACK in the form of a weekly podcast. For those of you meeting me for the first time, I'm a former radio talk show host. My work as a radio personality in El Paso, Texas, from 2005- 2011, was beyond enjoyable and rewarding; I was paid to talk to humans for 1-3 hours a day on live, call-in radio. My radio shows took many forms; political talk show host on a call-in station, lifestyle talk radio host for "Charlando con La Gringa" (translation: chit chat with the white girl) on airwaves out of Juarez, Mexico, and host of "The Lisa D Show" a weekday call-in talk radio show featuring guest interviews and cultural news of the day. "The Lisa D Show" was my longest run as a talk radio show host, honoring me with a slick logo! When my family left El Paso, TX, for Evanston, IL, in 2011, I had intentions of setting up shop on a new platform ... it took me 6 years! Thank you returning fans for waiting for my voice to reappear and welcome new fans to my podcast, "The Lisa D Show." You can look forward to conversations with creatives, roughly 20 minutes in duration, posted on a weekly basis. 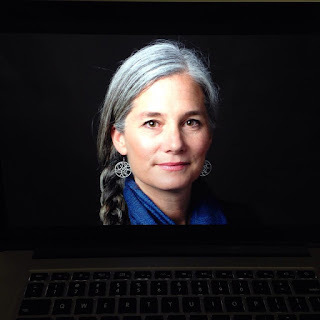 I believe creatives (of all kinds) make our planet a more connected, interesting and beautiful place to live. My energy and enthusiasm for my guests will be consistent, I don't invite guests whose work I don't admire. This podcast will 100% FOTP (Focus on the Positive) and isn't a criticism-based platform. Don't be afraid to request to be on the show, email me at thelisadshow@gmail.com. "The Lisa D Show" will be recorded in a former Polish Grocery Store at 1100 Florence Ave. in Evanston, IL. We welcome a live audience and will announce podcast recordings and guests using Facebook Live so you can stop by and see the podcast in action. Before I forget I want to thank my supportive husband Dave Ford for nudging this project along and helping get me back in front of a microphone. Dave is very familiar with my love of conversating and thinks I do it very well, his enthusiasm is much appreciated! Evanston Made is a month-long celebration of the arts in Evanston designed to create opportunities for artists to engage with the community. 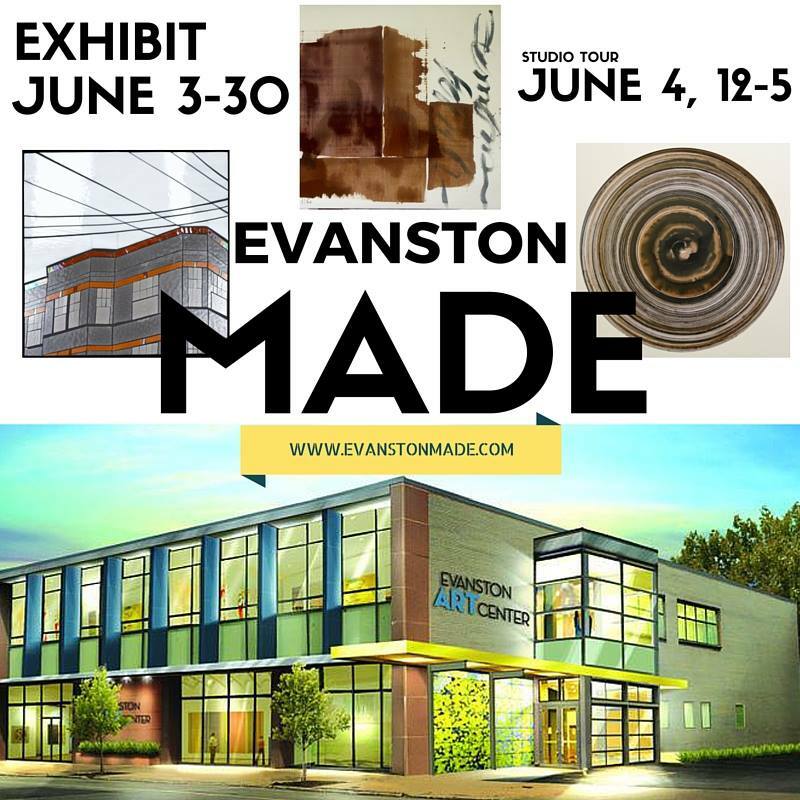 (and vice versa) Art studios, galleries, museums and businesses throughout Evanston will show works by Evanston creatives June 3-30. Evanston Made's artist studio tour takes place June 4, 12-5 p.m., with more than 75 artist's studios open to the public. Maps for the studio tour will be available online and at participating venues. The Evanston Art Center will host an exhibit, June 3-30, featuring works by Evanston creatives. The exhibit opening is June 3, 5-9 p.m. Participating venues will show works June 3 - 30. If you are an Evanston business owner interested in participating, click here to sign up. This is the ONLY blog post I will publish in the month of December, which is totally illegal, I should never go radio silent for that long. BUT it's been a really busy year and I've got projects that have consumed me in fantastic ways. As you know, I'm a gypsy by nature, lover of shiny keys and all things new, so I'm very aware of cities and what they offer - Evanston so far has offered me the moon and I'm so grateful. When we moved here in 2011, I told my husband Dave Ford it would take us five years to rebuild our lives - financially, socially, etc. - after moving from El Paso, Texas. Summer of 2016 is our 5-year anniversary, stay tuned. 1. 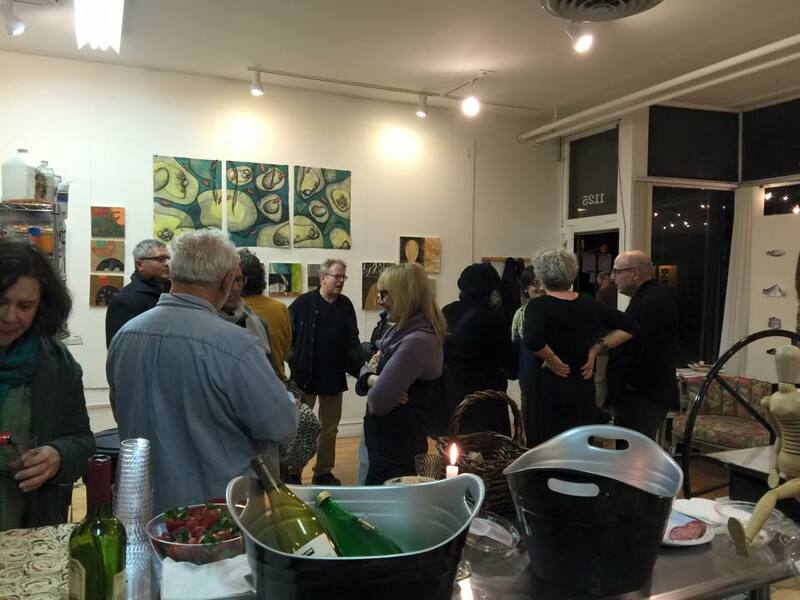 Evanston's annual Open Studio Artist Tour will celebrate its 3rd year anniversary and will get a new name so we can stop confusing the annual event with the non-profit Open Studio Project! Stay tuned. 3. My new role as Engagement Director at Hackstudio, requires I help grow a successful new endeavor in this market and I'm so inspired to do so. Hackstudio's focus is to help people connect with who they are and connect who they are with the world! 4. I'm proud to be the returning Evanston Arts Council Co-Chair with my colleague in the arts, Dino Robinson. Join us and get the arts funded and celebrated in Evanston! Additionally, I will continue to work on raising smart and giving citizens of the world (Miles & Louie) and providing shelter for ONE angry bunny. Thank you for your continued support and love for all my endeavors. Let me know if we can work together in any of these buckets! My first blog post from Monday, June 27, 2011 - We Have Arrived! 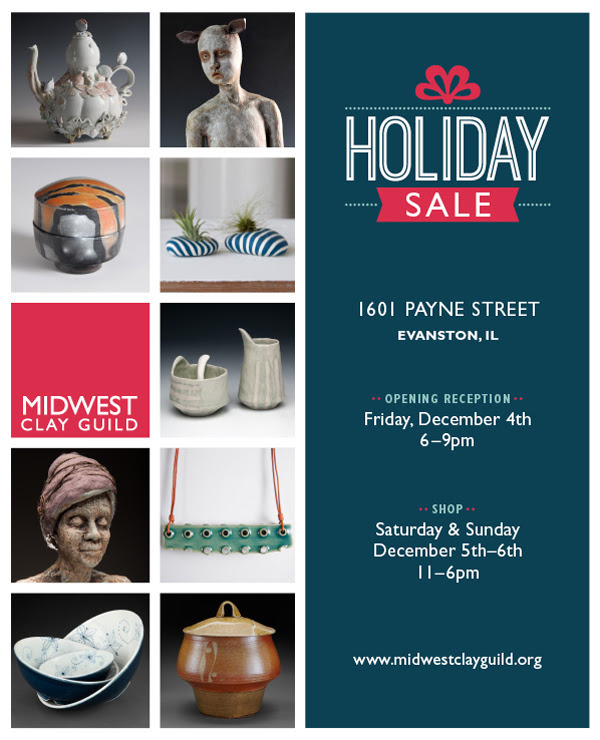 You're invited to the Midwest Clay Guild's Annual holiday ceramics sale! Shop work made by guild members as well as select visiting artists. The Midwest Clay Guild provides communal studio space and facilities for ceramic artists. Created in 1971, it is one of the oldest cooperatives in the United States. The Guild includes functional potters and ceramic sculptors who exhibit locally, nationally, and internationally. 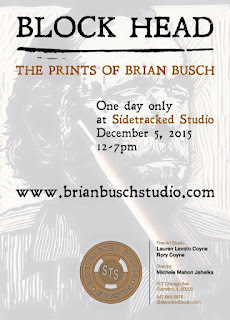 Saturday, December 5, 12-7 p.m.
From Sidetracked Studio: First of our one day pop up events for the holidays. 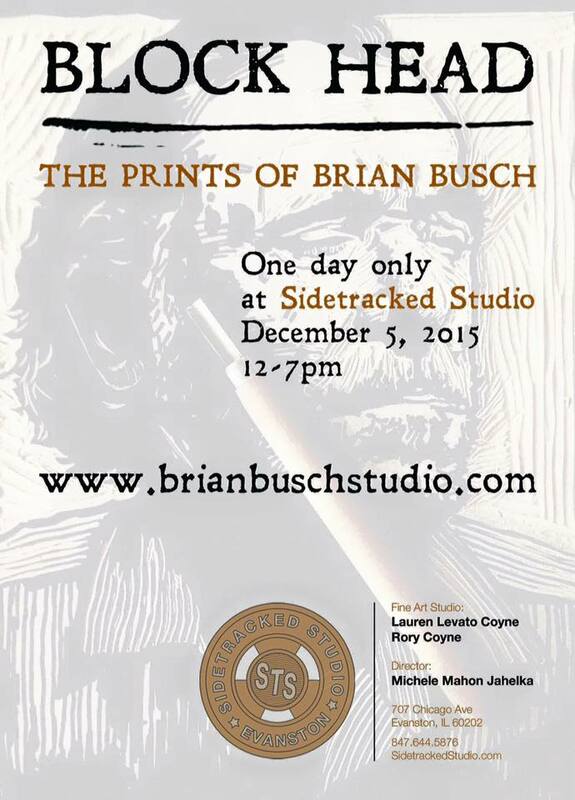 Brian Bush has shown at Sidetracked Studio with his paintings, but this Saturday he will be here with his fantastic linocut prints for one day only! Not only that but Brian will be present as well. 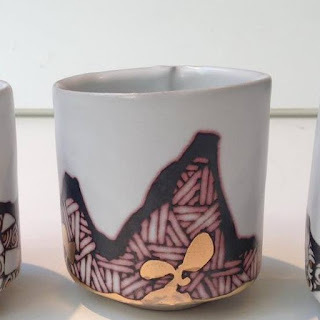 So come by not only for this pop up, but for "Undiscovered Species" with artists Jordan Scott, Julie Murphy, Vito Desalvo, Lauren Levato Coyne, and Rory Coyne. Lauren and Rory will be working there all day as well, so be sure to come by! MasterChef Junior Casting will be held in Chicago on Saturday, December 5th. 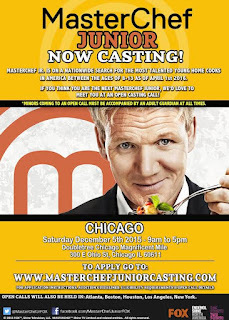 They are looking for kids who love to cook and want to try out for this fun lighthearted show. "The casting call is a total blast for all the kids who try out and everyone leaves with a huge smile, feeling like a winner!" From Nicole Mirkof, Casting Associate Producer, MasterChef Junior, "I have to tell kids not to be intimidated by the skill level they see on our show because no one walks into our open casting call cooking like a MasterChef. We are looking for passion and the potential to learn and blossom into the MasterChef inside each and everyone of them!" Rick Bayless wants you to eat lunch at Frontera Fresco in Evanston, today!